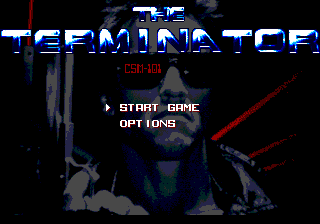 The Terminator for the Sega Mega-CD is a platform shooter based on the film with the same name. Though it shares the same title and basic premise, it is unrelated to the Sega Mega Drive version, sporting more fluid and detailed graphics, new gameplay styles and a CD audio soundtrack. Furthermore it features movie scenes taken from the motion picture (although limited to 16 colors, not employing the technique that allows a higher color count, as seen e.g. in Eternal Champions: Challenge From the Dark Side). Guns and Grenades are assigned to and buttons respectively. is used for jumping. It's possible to run and shoot at the same time, or stand in a fixed position, depending on which button is pressed first. The main weapon can be upgraded by collection power ups. A life system is in place, with hidden extra lives scattered throughout the game. Small nodes are used as checkpoints. Continues and a password system are absent. The overall length is around 45 to 60 minutes of gameplay, compared to the Sega Mega Drive version that is around 15 minutes of gameplay long. The game also features a number of bosses, although they don't provide a significant higher challenge than standard enemies. Note: this game divides its credits into two - the "main" developers are listed in the introduction, while assistant staff are listed in the end credits. Main article: The Terminator (Mega-CD)/Magazine articles.